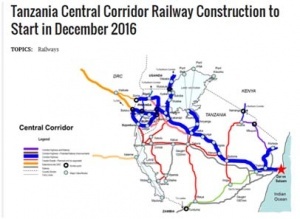 The construction of Tanzania’s standard gauge railway (SGR) along the central corridor is set to start in December 2016. The 2,190km railway involves the construction of a SGR from Dar es Salaam … to Makame Mbarawa, Tanzania’s Minister of for Works, Transport and Communications, the SGR project will be completed in 4 phases over the next 3 years. Tanzania President Magufuli recently noted that the implementation of the railway project will help lift the economy of Tanzania and its neighboring countries, including Uganda, Rwanda, Burundi, and the Democratic Republic of Congo (DRC).